Sorry for the schedule change kids. But look at it this way, you’re not just getting the newest episode of “The Right Now Show” late, you’re also getting “Stuff that Weighs More than Me” early. So look on the bright side. And once again, for your viewing and imagining pleasure, I bring you a truly massive chocolate sculpture. 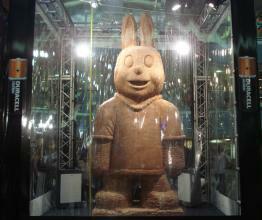 I bring you, the world’s largest chocolate bunny! This guy was created in South Africa by artist Harry Johnson. Apparently this sculptor is well known for creating sculptures really, really fast, so he was pretty excited about working in chocolate. Conclusion: The World’s Largest Chocolate Bunny weighs more than me. This entry was posted in Uncategorized and tagged 3 tons, bunny, chocolate, chocolate sculpture, Duaracell, easter, easter bunny, rabbit, size acceptance, Size Diversity, south africa, stuff that weighs more than me, world record on March 28, 2013 by fatchicksings.